by Truus Matti. Novel. 156 pages. Grades 4-9. It's 1943 in New York City and Linus's older brother is headed off to fight in World War II. In their lower class family the children "move up" a job and 12-year-old Linus takes over his brother's delivery route for the family produce store. 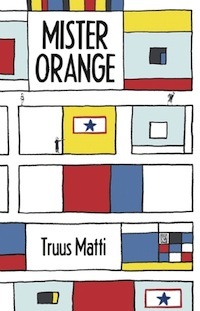 It's while making regular deliveries of a case of oranges to an artist he calls Mister Orange that he gets to know the man who turns out to be the Dutch modern painter Piet Mondrian (whose style is echoed on the cover). Linus's responsibilities for prompt and accurate deliveries, his imaginary conversations with a superhero charged with protecting his brother and his friendship with the artist combine to frame a wonderful coming-of-age story. Matti is a Dutch author and this book was first published in the Netherlands and has now been translated into English. We're very lucky it has been. It's beautiful written with an excellent translation and it's portrayal of Manhattan seems written by a New Yorker. Matti starts her book with a flash forward to two years after the start of the book where Linus is flying along the streets of Manhattan in shoes that fit perfectly when he sees a poster in a window with a photo of a familiar face. After that short tease we are whisked back to 1943 and again the focus is on shoes. In his family the children hand down their shoes to the next in line whether they are going to fit well or not. Linus has just gotten his brother's old shoes. Even though his previous shoes were way too tight these "new" shoes are huge. Even stuffed with newspaper and laced tight he has trouble walking in them. The shoes prove significant while he is struggling to do a good job delivering the right fruits or vegetables to the right restaurant or individual. Matti has given us an utterly believable character, even when he is talking with the imaginary superhero. Linus' older brother has left Linus with the responsibility of looking after his pristine comic book collection which includes notebooks he has used to hone his own comic book creating skills. It's there that Linus discovers the superhero he will turn to over and over again as he worries about his brother. While delivering the oranges to Mister Orange he notices that the artist has put squares of color up on his blank white walls in various arrangements to achieve specific effects. This fascinates Linus, even while he knows his parents would think it was all frivolous. He is intrigued by the way the bold colors vibrate and how they change depending on where they are placed. This is a nice introduction to modern art seen through the fresh eyes of a working class boy encountering it for the first time. 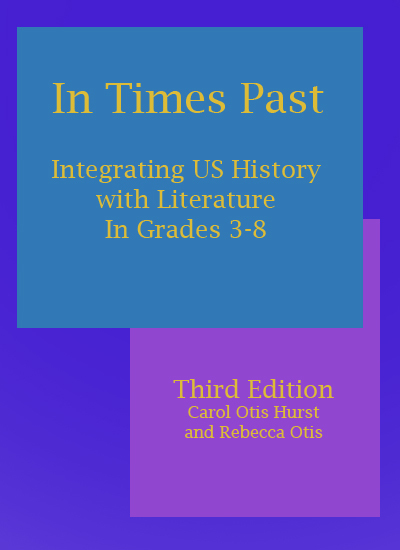 Classroom activity ideas and a long annotated list of some of our favorite books.